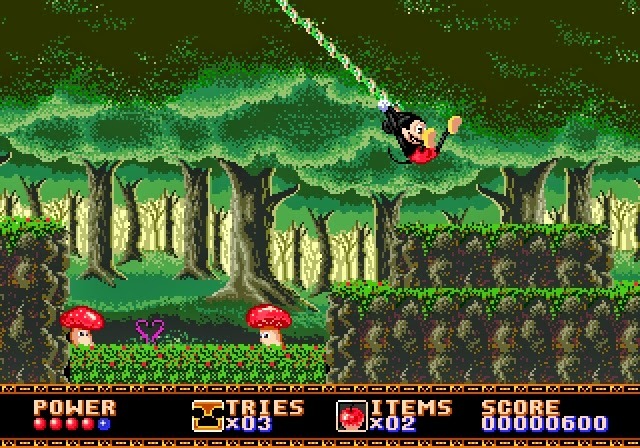 Castle of Illusion is a side-scrolling platformer and the first in the popular Illusion series that graced Sega's 8-bit and 16-bit consoles. You play the role of Mickey Mouse and it's the usual 'damsel in distress' story where you have to save Minnie from the evil Mizrabel. To do this you'll need to collect seven gems and beat each boss in the game's five levels. Each level is distinct and there's tons of variety in the design including forests, a toy land and a library; there's even mini-stages that take place inside a milk bottle and a cup of tea! I also like the stage where you can flip the screen upside down to defy gravity and kill enemies! There are a few items you can use for long range attacks such as apples and marbles - although they're not as powerful as jump attacks they do make the bosses much easier to defeat. The game isn't too difficult and there are only a few moments that will likely cause you any problems. Thankfully the exceptional level design and tight controls keeps things interesting. The backgrounds have an oil painting look to them and they're absolutely stunning when combined with the parallax scrolling and transparency effects that have been used. The animation is superb with lots of subtle details such as the dancing flowers and the way Mickey sways from side-to-side if you leave the controller alone. The music fits perfectly, especially the Toy Land level with its marching drum pattern to fit with the toy soldier enemies. In comparison to World of Illusion (Mega Drive, 1992) I was wondering why Mickey was moving much slower and I realised it's because he doesn't have a dash button - this would have helped to speed up some sections but it's really just nitpicking. Castle of Illusion is a high-calibre platform game and all of its parts just fit together perfectly. Even though it's squarely aimed at children it's so well designed and crafted that anyone with a passing interest in the genre will find themselves enjoying this title from start to finish. Random trivia: This game was remade for the PC, PlayStation Network and Xbox Live Arcade in 2013. It's really more of a reimagining though as it includes 2D and 3D areas as well as voiceovers.